"Everyday, we try to look for miracles to happen in our lives. After having watched Bruce Almighty last night, I can't forget the lines of the one who played God - - The miracle is when a person has two jobs, tends to the family needs, and still manages to attend her son's baseball game (something like that)...and then his last lines...We shouldn't be looking for miracles in our lives. Instead, we should BE THE MIRACLE. To all my teacher friends, former students, and colleagues, we have a huge responsibility as educators but none of us entered this field for convenience. We knew all along that this job is a tough one but each time we make a difference in the lives of our students, even the realization on their parts comes at a much later time, I know how fulfilled you all become. i know I am. I am proud to be an EDUCATOR. Happy National Teachers' Month!" This message was quoted from a friend's FB wall. Ms. Tricia Coralejo-Montinola, an Administrator of School of St. Anthony's and an educator herself. Quite astonishing to see people realizing their value as an educator, public servant and God's servant. 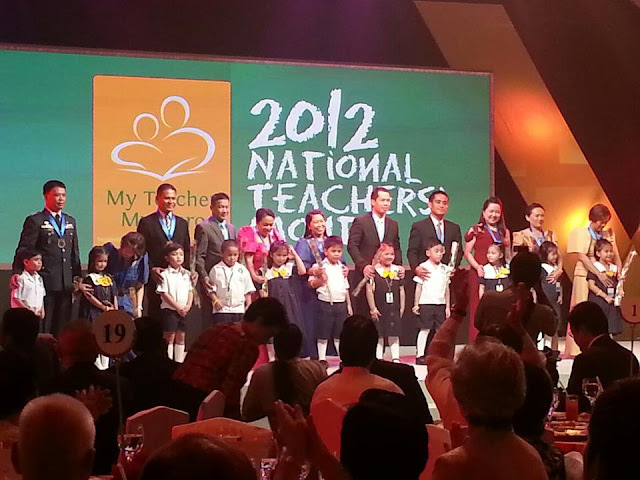 ceremonies of the awardees for Search for Outstanding Teachers (SOT), Search for The Outstanding Philippine Soldiers (TOPS) and Search for Country’s Outstanding Policemen in Service (COPS) in an event dubbed as 2012 Metrobank Foundation Outstanding Filipinos. Ten gallant soldiers from the Philippine Army, Philippine Navy, Philippine Air Force and Corps of Professors feted in the stage together with the other awardees. The outstanding soldiers of the Armed Forces of the Philippines (AFP) are: Colonel Milfredo M. Melegrito, Master Sergeant Juana R. Hernal and Technical Sergeant Rolando L. Diomangay, from the Philippine Army; Captain Erick A. Kagaoan, Engineman Second Class Arce D. Balasabas and Engineman Third Class Ricky R. Burgos, from the Philippine Navy; Lieutenant Colonel Antonio Z. Francisco, Jr., Senior Master Sergeant Augusto D. Reyes and Master Sergeant Emerito R. Angcao from the Philippine Air Force; and Colonel Raul J. Tangco, Prof, from the Technical & Administrative Services – Corps of Professors. The Metrobank Foundation, Inc. (MBFI) and the Philippine National Police (PNP) together with Rotary Cub of New Manila East and PSBank, gave way to the four (4) policewomen and six (6) policemen who emerged as winners in this year’s Metrobank Foundation, Inc. Search for Country’s Outstanding Policemen in Service or COPS. Four (4) commissioned officers made it to the list and they are: Police Superintendent Belli B. Tamayo (Quezon City); Police Chief Inspector Vicente S. Cabatingan (Laguna) Police Senior Inspector Charity S. Galvez (Butuan City) and Police Superintendent Bernard M. Banac (Quezon City ). On the other hand, the six (6) non-commissioned officers are: Police Officer 3 Eduardo D. Santiago (Pangasinan); Senior Police Officer 3 Renjun O. Bagaman (Koronadal City); Senior Police Officer 3 Rhia B. Sotomil (Iloilo), Police Officer 3 Mary Jane B. Perez (Cotobato City); Senior Police Officer 4 Ma. Rosario Y. Suarez (Davao City); and Senior Police Officer Robert U. Fabregas (Quezon City). Lastly, (though this was the first conferment of awards amongst the three categories), the recognition of the winners to join the rank of 306 Outstanding Teachers who have been honored by the Foundation since 1985. Elementary competition winners are: Dr. Roberto D. Santos, Jr. of Sta. Rita Elementary School (Capas, Tarlac); Nueva P. Mangaoang of Man-it Integrated School (Passi City); Rizal M. Vidallo of Anabu II Elementary School (Imus, Cavite); and Mariam B. Rivamonte of Santa Cruz South Central School (Santa Cruz, Marinduque). Secondary competition winners are: Dr. Annie I. Rodriguez of the Philippine Science High School-Southern Mindanao Campus (Davao City); Bonifacio D. Caculitan, Jr. of Ernesto Rondon High School (Quezon City); Marivi L. Castro of General Santos City SPED Integrated School; and Galcoso C. Alburo of Concepcion Integrated School-Secondary (Marikina City). Meanwhile, Dr. Hilda C. Montaño of the West Visayas State University (Iloilo City) and Dr. Catherine P. Vistro-Yu of the Ateneo de Manila University (Quezon City) are the winners for the higher education category. As we all commemorate teacher's month this September let us take a closer look into the thoughts of these teachers who were chosen to be among the winners. As I ruminated over how these men and women got nominated, I came to a point pondering over the background of each winner. "Teaching requires a lot of sacrifices," and none like teaching is as gratifying and fulfilling for her. Some have designed innovative instructional materials and approaches like in Math (Mamgaoang), strategic interventional materials (Santos), invented numerous Teaching Aids (Rivamonte), while some just enjoy being the second parent, servant leader for the youth, never giving up on students and all this while satying grounded and humble. Another background just caught me by surprise entailing how heroic our teachers can be, like Galcoso Alburo's. During Typhoon Ondoy, he risked his life to save more than 400 people by pulling to safety each man, woman and child starnded in ten-feet muddy water, armed only with a rope and a big-couragous heart. The ceremony was followed by an opulent lunch from Shangri-La Hotel. Thanks for quoting me Joy. I noticed that 2 of the teachers awarded are from Iloilo. Good job to them and to the rest of the awardees! Hi TC, Yes! Best Teachers are all over the country. Most of their stories are far more inspiring than the ones nominated coming from the metro.